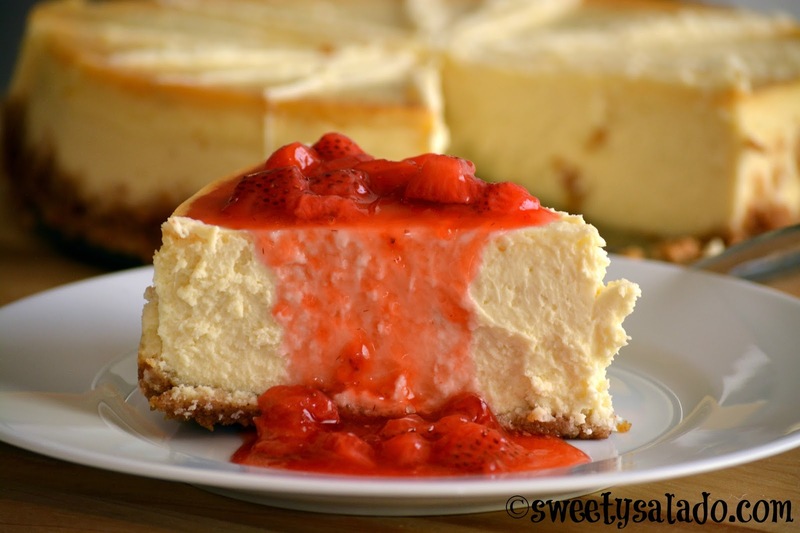 One of the best desserts that you can serve at a party is a delicious cheesecake. It’s simple, elegant and you can serve it after any meal. And even though some people may say that it can be difficult to make or that is’ not easy to make it right, I say it’s the complete opposite. The problem many people have is with the cracks you sometimes get in the center while it’s baking in the oven. There are many reasons for this. First, you have to mix all the ingredients really well but not too much because you don’t want to add tons of air to your batter. That’s why it’s always best to mix everything by hand and if you have a wooden spoon, it’s even better. Secondly, you have to grease your pan really well so the batter doesn’t stick to it. Once it sticks to the pan it will crack in the middle as it tries to pull away from the sides while cools, which is completely logical. And finally, don’t open your oven no matter how much you really want to because that will dramatically change the temperature. One more reason for your cheesecake to crack. In all honesty, it really doesn’t matter if your cheesecake ends up with a big crack in the middle because what really matters is how good it tastes. And anyway, you can still cover it with a delicious sauce like the strawberry sauce we made last week. But I’m totally convinced that if you follow all my steps, your cheesecakes will come out perfectly. You’ll see! Pre-heat oven at 350ºF (180ºC). Place crackers in a resealable bag, seal the bag and crush them with a rolling pin or bottle until they resemble sand. You can also crush them in a food processor. Place the crumbs in a medium bowl and add the melted butter, white sugar and ground cinnamon, mix well. Grease a 9 inch (23 cm) springform pan with butter, pour in the crumbs and press them well with the palm of your hand or the bottom of a flat cup. Set it aside. In a small bowl mix the sour cream, all purpose flour and vanilla extract. Set aside. In a large bowl mix the cream cheese and white sugar with a wooden spoon or spatula until they're creamy. Add the whole milk and then add the eggs one at a time, mixing just enough to incorporate them. Finally add the sour cream and mix to incorporate. Cover the bottom of the pan with aluminum foil to keep water from seeping in and pour in the batter. Place the pan inside a larger pan. Pour enough boiling water inside the larger pan until it comes halfway up the sides of the smaller baking pan. Bake for 1 hour, turn off the oven and let it cool completely inside the oven without opening it. About 5-6 hours. 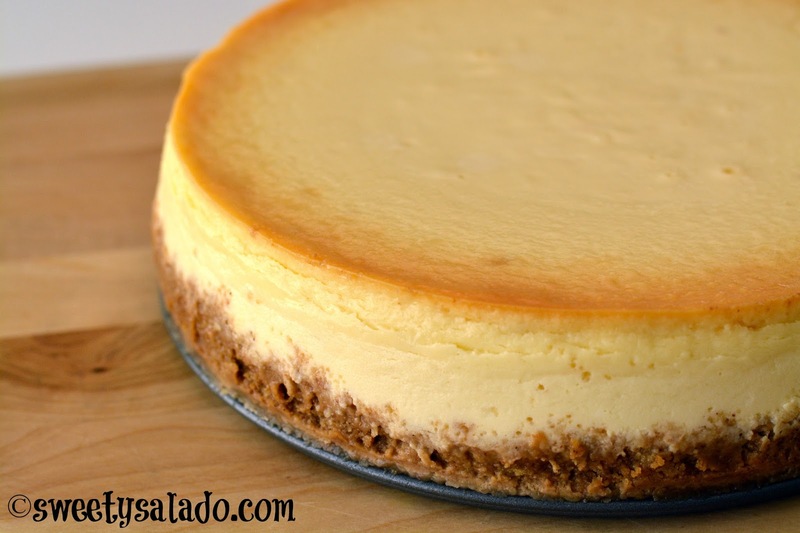 Cover the cheesecake with plastic wrap and refrigerate it overnight. Serve alone or with strawberry sauce.